The Sobon Estate started life as Uhlinger Winery in 1856. It was purchased by Enrico D’Agostini in 1911, and remained in that family until 1989 when Leon and Shirley Sobon of Shenandoah Vineyards purchased the winery as a 30th anniversary gift to each other. 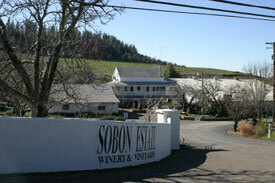 They reopened the winery in 1990 under its new name Sobon. 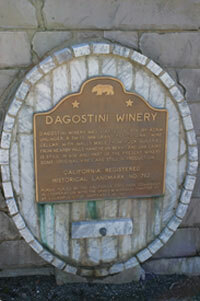 The tasting room area now contains a museum that celebrates winemaking and agriculture in the foothills. The museum is housed in the original winery building, constructed with rock quarried from the nearby hills and hand hewn beams made from local oak trees. The original oak casks built by the Uhlinger family in the winery's early days are still in use and on exhibit. The Sobon Estate also has a scenic picnic area next to the tasting room. The estate has 113 acres and came with some gnarly Old Vine Zins, most notably the Rocky Top, Cougar Hill and Lubenko Vineyards. There are also 35 acres of Rhone Varietals planted. The estate vineyards are all organically farmed, and received California Certified Organic Farmers certification in 2002. The Sobon Estate winery has made a name for itself for its great Rhone style wines. But its single vineyard Zinfandels; Rocky Top, Cougar Hill and Lubenko, with their fruit forward, deep, rich flavors, are worth the trip to the winery all by themselves. Leon Sobon was a research scientist at Lockheed research lab, and a hobby winemaker when he and his wife Shirley decided to leave the Silicon Valley of California and take up winemaking as a career and lifestyle. It was Leon’s love of the Zinfandel grape that drove them to the Shenandoah Valley. Their son, Paul, assists his father as winemaker at the two family wineries, Sobon and Shenandoah.